I know, I know! I haven’t posted in a while. LAY OFF ME! I started a new job, I’ve been traveling and life has just been one crazy whirlwind. But, I am back in full force with a new EASY recipe for you guys. The holidays are right around the corner and I think this recipe is perfect for the holidays. Do any of you have a Pinterest account? I do and let me tell you… it has been sucking the hours out of my day! All I do is pin things here, pin things there. Most of those things are food…LUCKY YOU! I was talking with one of my girl friends earlier today and we were planning a dinner get together this weekend. “You make one dish and an adult beverage and I’ll make another dish and dessert”, I said to her. Well, wouldn’t you know that the perfect recipe fell into my lap within 2 seconds of suggesting this idea to my friend! So, here it is, the moment you’ve all been waiting for. 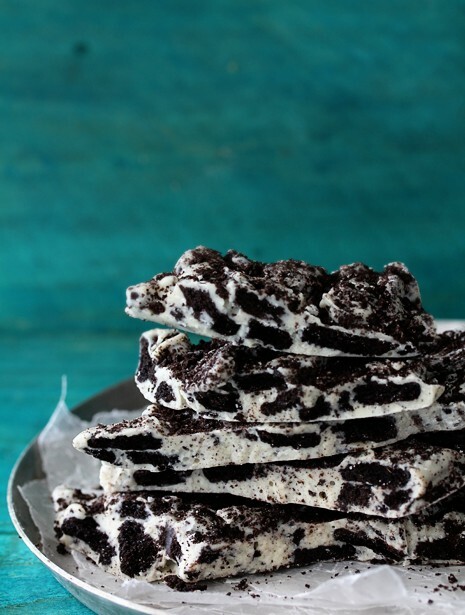 OREO BARK RECIPE!!! Preparation: Line an 8×8 pan with enough parchment or wax paper for a 1 inch overhang on each side. Place chocolate in a double boiler over low heat and stir continuously, until chocolate is completely melted. Transfer chocolate to a heat proof bowl and cool for 5 minutes. Add chopped Oreos and stir to combine. Pour mixture into pan. Use a spatula to smooth out top. Finely chop remaining Oreos and sprinkle on top. Chill for about 10 minutes until chocolate becomes solid. Lift whole bark out of pan by holding onto parchment or wax overhang. Split bark into pieces with a fork. There ya have it, folks! I hope you all enjoy this amazing recipe, just in time for the holidays. I also have fun mixes in a jar recipes coming up, too!! !